‘GOOD GUYS IN BAD GUYS OUT’ ARE THAI IMMIGRATION AUTHORITIES JOKING? SO HAS THE WORLD’S LARGEST ADULT PLAYGROUND BEEN TAKEN OVER BY FRAUDSTERS? Paul Hayward arrived in Thailand in the late 90s and was recruited by the American run boiler room International Asset Management. He fled the country during the raids on boiler rooms in Bangkok in 2001, which had been prompted by the Australian Federal Police, and was one of a group of four people who handed over U$100,000 police at the airport to be allowed to board a plane to Zurich. Hayward is now a millionaire 100 times over, but, of course, not on paper. He has over 100 companies in Thailand and other countries all in the hands of nominees, Thai and foreign, and relatives, friends and employees of his. The Thai nominees include lawyers and policemen. Both the Fraud Recovery Group, a group of victims who lost US$20million, and I have passed information on to law enforcement in the U.K. and Europe. 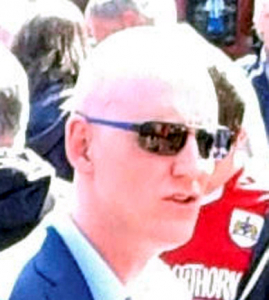 That information included lists of victims, the false products he was selling, the fake companies he had started, and his banker-money couriers and of course witnesses. I have also passed on information to AMLO and the DSI in Thailand. 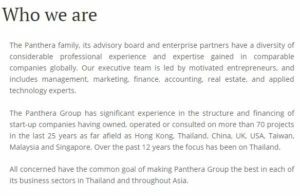 As expected the website does not show ‘the team’ and the owners but refers extensively to ownerships grouped under headings, (1) Panthera Security Team, black-shirted off duty cops and army (2) WCKD which covers his nightclubs ‘Insanity’, ‘Sugar’ and ‘Levels’; (3) Yumbite covering food outlets and bars, and (4) Panthera Property covering his real estate including ‘Nana Plaza’. This is not true. It is typical of boiler room spiel. 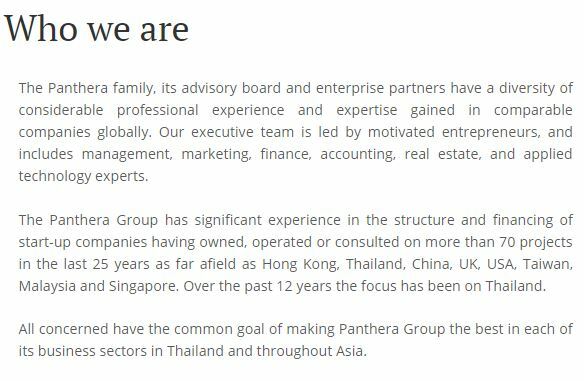 Panthera Group is a recent start-up and his company Eclipse operated from there with Mike Doherty. This company was administering businesses it did not own (on paper) . He started buying up stuff in Thailand from 2001. Twenty-five years ago, he was 18 years old! Nothing was under the name Panthera. But associates of his and his boiler room companies show up on the Panama Papers. Hayward has attempted to re-invent his past by asking ‘Stickboy’s’ predecessor ‘Stickman’ to insert his name in entertainment blogs dating the stories prior to 2001. Paul Hayward has told me that he will not be caught because he does not have a bank account and puts nothing in his name. Boiler room minions, the telephone qualifiers and loaders, of course, all use false names. As I am the only person writing about Hayward apart from the pseudo journalist ‘Stickboy’ who writes in a very grovelling fashion, I assume therefore he is talking about me. I of course have never requested £20,000 though attempts were made to buy my website. Due the violent history connected to boiler rooms in Asia I am of course not willingly providing my home address, but on the other hand I am not in hiding. However, as I am now settled in the U.K., and have my children happily settled in schools etc., I am now inviting Mr. Hayward to present his writ in person to me in public at Heathrow airport on his next trip to the United Kingdom.